St. Bernardus Abt 12 is an award winning quadrupel that pours a hazy brown with a frothy beige head and expressive carbonation. 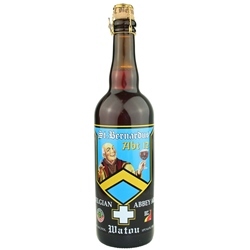 Top fermented, bottle conditioned and matured for three months, the brew boasts aromas of dried fruits, plums and raisins, coffee, cherry, bread and caramel. Taste follows the nose and includes candy sugar sweetness balanced by spice, coriander, a big hit of malt, fruit, and the warming power of 10.0% ABV. The mouthfeel is soft, smooth and medium bodied. The finish is dry, warm and slightly bitter. This beer is a perfect ingredient in and accompaniment to classic Belgian stews, such as rabbit and prune casserole or beef carbonnade. Blue cheeses of the Roquefort type also make for an ideal pairing, and don't overlook chocolate desserts for an unexpected but very successful combination. 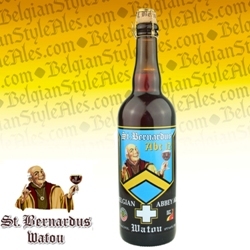 Serve at 46 - 57 degrees F.
The St. Bernardus Brewery was founded in 1946 by Evarist Deconinck. When the Trappist monks of the St. Sixtus Monastery in Westvleteren, Belgium decided that brewing and promotional efforts had become a serious distraction from religious and contemplative activities, they granted Deconinck a license to brew and distribute Trappistine beers based on the monastery's recipe. That arrangement continued for decades, but in 1992, when it was decreed that only beers brewed within the walls of a monastery under direct control of the monks could be called Trappist beers, St. Bernardus launched its own brand of abbey beers to huge success. Today, the brewery distributes award winning ales to more than two dozen countries including the United States, Canada, Brazil, Australia and Japan. Apr 11, 2019 | By Charissa M.
We discovered this beer at our local Raley's store...got totally hooked...then they discontinued it! This beer has a cork that pops with a wonderful bang, followed by a dark, full flavor. We do add a bit of bourbon, but alone this beer is perfect anytime!!!! We are so glad to have found it here, at Belgian-Style Ales. We will have to check out all the OTHER wonderful treasures you carry! Oct 3, 2018 | By Frank C.